There are a lot of programs out there that let you time one or multiple activities on a computer. Cherry Tomato does that for instance automatically by gathering information about the windows that are in the front of the screen. Other programs like Chronometask, Free Light Timer or Time ComX offer timing functionality as well. Most however do not allow you to keep track of multiple timers the way WatchMe does. The program allows you to create multiple timers to keep track of your day to day activities. The main program window displays all timers, controls to start, stop and reset their time, individual times for each timer and the total time of all timers. You can start, stop and reset each timer individually. New timers can be added easily from the Timers menu. The program even supports tabs to group timers, for instance by day of the week or type of work. Besides the ability to name each timer individually, it is possible to add notes to timers, which can be useful to document processes or keep track of things that have been done in the time. Timer alerts can be configured to notify you when a set period of time has elapsed. You can further configure the program in the Options. Here you can change the default time format from the default hours:minutes:second to another one, e.g. 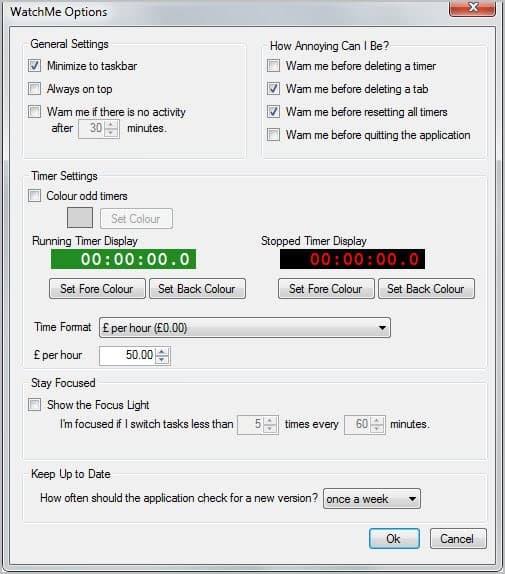 minutes or $ per hour, change colors, enable the stay focused option or enable warnings. There are also options to export data as csv or xml files to import them into other applications like Microsoft Excel or other timer applications. WatchMe can be a very useful application for users and businesses alike. This can be used to keep track of different work related tasks. Tech support for instance could use timers to keep track of the time they spend on the phone, replying to emails, using remote desktop sessions, communicate with employees in person or walk around in the building to get things fixed.